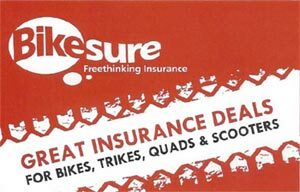 We are doing an ongoing Insurance Promotion with Bike Sure. If you take out a policy with them quoting reference T313, not only will you preferential rates, but also Peter Cairns Motorcycle Training will fill up your tank to a maximum of £15! A double bonus! 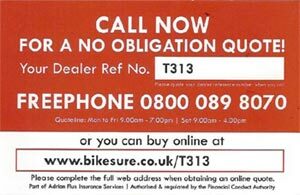 All you need to do is to ring Bike Sure on 0800 089 8070 and quote T313. Once your policy is up and running, let us see a copy of the policy and bring us your receipt for your fuel (Maximum £15) and we will reimburse you.